Have you ever wondered how Mother's Day got started? People started honoring mother's a very long time ago. When it first started it was called Mothering Sunday because people celebrated it the fourth Sunday during a time called Lent. Lent is the time before Easter where people think and prepare about the Easter story and what God did for us. Then 150 years ago a woman named Anna Jarvis, organized a day to raise awareness of poor health conditions in her community, something she thought mother's believed in doing. She called it "Mother's Work Day." After Anna Jarvis died, her daughter (also named Anna) wanted to honor all that her mother did. Anna heard her mother say that one day she hoped someone would make a special day just for mothers. So Anna worked very hard and even talked to presidents and other leaders to try to create a special day just to honor them. 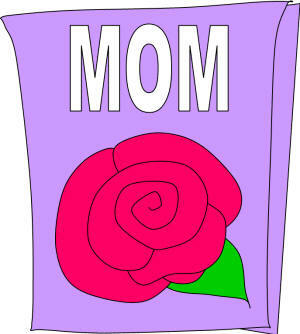 By 1914 (almost 100 years ago) a man named Woodrow Wilson signed a bill recognizing Mother's Day as a national holiday. It just so happens that Anna's mothers' favorite flower was the white carnation and that's why mother's often receive carnations on Mother's Day. The funny thing is, Anna ended up disliking Mother's day. She didn't want Mother's day to be all about the expensive gifts and fancy flowers but just a day to tell your mom that you love and appreciate her. So remember, moms don't need all that fancy stuff. Make her a nice card and treat her very special today (and everyday) and she won't need anything else. Mother's are very special, so special that they are mentioned in the Bible. Since the Bible is like an instruction manual for us, it gives us instructions on how to treat our mother. Do any of you know what the ten commandments are? They were rules that God gave to Moses for all of us to follow. Each commandment is very important and God gave each commandment for a reason. One of the commandments says: Honor your father and you mother, so that all may go well for you and that you may enjoy long life on the earth. What does honor mean anyway? Honor can mean many things. When we listen, obey, love, appreciate, and forgive our mom that is how we honor her. That means when she asks you to do something you should do it right away without complaining. When you show you love your mom by hugging her and telling her that you love her that's another way to honor. You can also appreciate your mom by thanking her when she does things for you (cleaning the house and your clothes, making supper, helping you, etc.). Our mom won't be perfect all the time, we all make mistakes. So we should forgive our moms when they make mistakes because God asks us too. Another verse in the Bible asks us to bless our mom. It says, "Her children arise and call her blessed." Some words that describe blessed are that your mom belongs to God and we need to treat her like she's God's child. Your mom used to be a child too and she's just trying her best to help you grow and learn things. So, treat her nicely! Another way to describe blessed is to be happy. Do you make your mom happy? I'm sure you do a lot of the time and moms can be sad because of different things sometimes too, but I don't think your mom would be happy if you didn't listen to her or disobeyed her. The last verse we're going to talk about today says: Children, obey your parents in everything, for this pleases the Lord. I know that sometimes you don't always want to obey your parents but its important that you obey them because it makes God happy! One last thing. No matter how old you get your mom is your mom. Sometimes you might think that you can talk back to our parents or that you know more than them, but you don't. The Bible says to obey your parents always, not just when your a kid. Your parents want the best for you and know what they're talking about. Don't forget that we also have a heavenly father that cares and loves us no matter what. So if you don't have a mother around all the time (or even if you do) God is always there. He is there when our mother can't be.